Slipped disc in the lumbar spine. 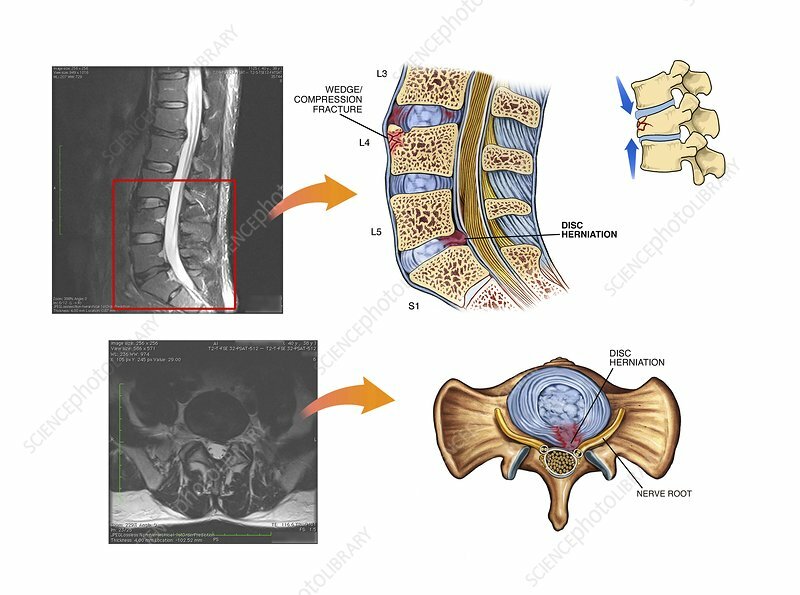 Labelled sagittal (top) and axial (bottom) artworks and corresponding MRI (magnetic resonance imaging) scans through the lumbar (lower back) spine showing a wedge-compression fracture (L4 vertebra, top) and a slipped (herniated) disc (L5-S1 joint, top and bottom). The herniated disc (a left paracentral protrusion) is pressing on the S1 nerve root of the spinal cord. The mechanics of the fracture are shown at top right. The discs of fibrocartilage between each vertebra form joints that allow the spine to bend and flex. Spinal disc herniation can cause pain and in severe cases may require surgery.